Nothing is more frustrating than wanting to do something and not knowing how to do it. In this How-to, we will be going over the some of FreeBSD’s more popular commands so we could make our lives easier and work more effective. You need a FreeBSD server that is configured with a static IP address. In FreeBSD, sometimes it can be difficult to remember so many directories and what they contain. Similar to Linux systems there is a manual that you can bring up and refresh your memory and continue working on your task. 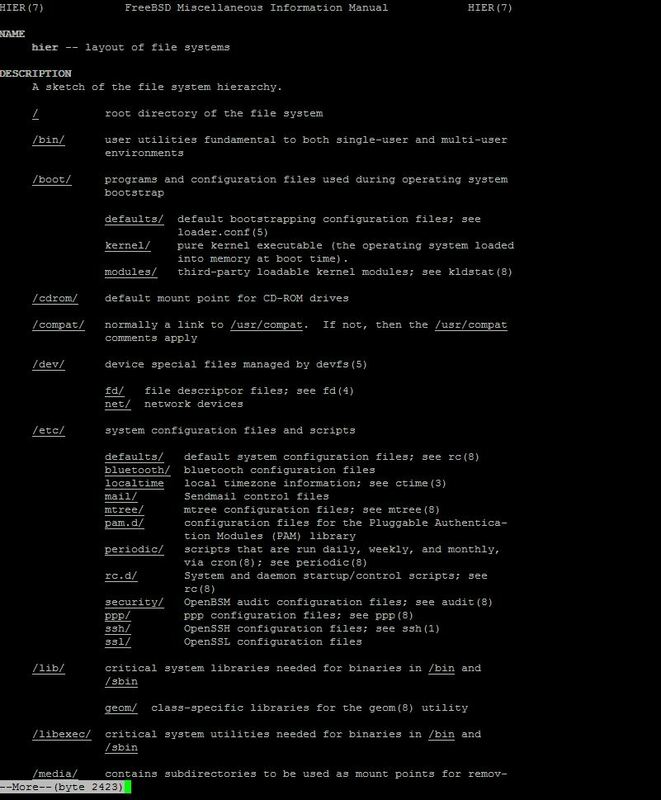 This is the directory Hierarchy manual, and it can be view with the following command. To find out information about your hard drive and how much space you have available or are consuming, the following command can help you accomplish this task. It will display this information in a very simple way. Go for it! If you would like to see how much RAM is available or assigned to your FeeBSD server, grab the following command that will display the real memory (total amount) and the available memory (available amount). If you are not sure of the exact version of FreeBSD that is on your system, this can be completed with the following command. It will display the running version of FreeBSD on your system. Knowing what you currently have installed on your FreeBSD server is very important because it helps in keeping things in order. To find out what Packages and version of those packages, copy the command below and paste it in your terminal. The ls(list) command is used to view files within specified directories. To view the files under your current directory run the following command. Although the following command applies to many Linux Operating Systems, it can also be used in FreeBSD. It is beneficial because it prints the directory that is currently being used. This helps out if you are not sure in what directory you find yourself in. Give it a try! You could also remove files with the rm command. Copy and paste the following command replacing the brackets and myfile with the file that you want to remove or deleted. Furthermore, you could move files from one place to the other following the command below replacing the myfile with your files name and location with the path that you want to place that file. To copy a file in FreeBSD, this can be accomplished by simply replacing the myfile with your files name and myfile2 with the name of the copied file. If you would like to create/make new directories in FreeBSD, this could be accomplished with the following command replacing the brackets and mydir with the new directory that you want to be created. To remove a previous or newly created directory, this could be accomplished with the following command replacing the brackets and mydir with the specified directory that you want to be removed. Congratulations! This completes this tutorial on FreeBSD Popular Commands. I hope that you find this information useful just like it was to me. Thank you for following along and feel free to check back with us for further updates, or learn more about our reliable HIPAA-compliant cloud hosting solutions.